Stuff Points: Earn 49 points when you buy this stuff. Give any room a spa-like atmosphere with this decorative humidifier. 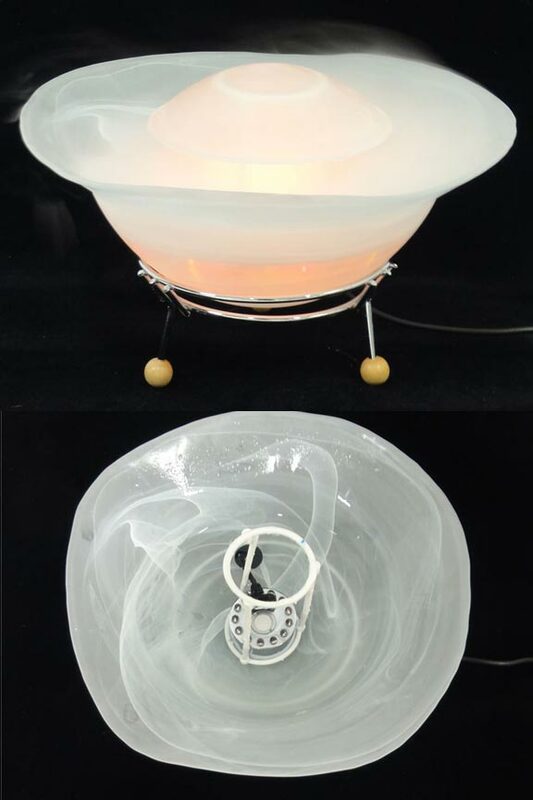 It is a water feature, color changing lamp, humidifier and fragrance diffuser in one. A small device sits in the middle of the bowl, submerged under the water. When activated, it will vibrate at high speed to evaporate the water in the bowl and create a never ending cloud of mist. This billowy fog will mix with the air in your home or office to increase humidity, and eliminate dry air. If you add some essential oil to the water, it will also add scent and neutralize odors as it improves air quality. Due to the unique function of the device, it also generates negative ions as it makes the mist, so it also acts as an air purifier. All of these benefits are great, but the main appeal of this product is its look. 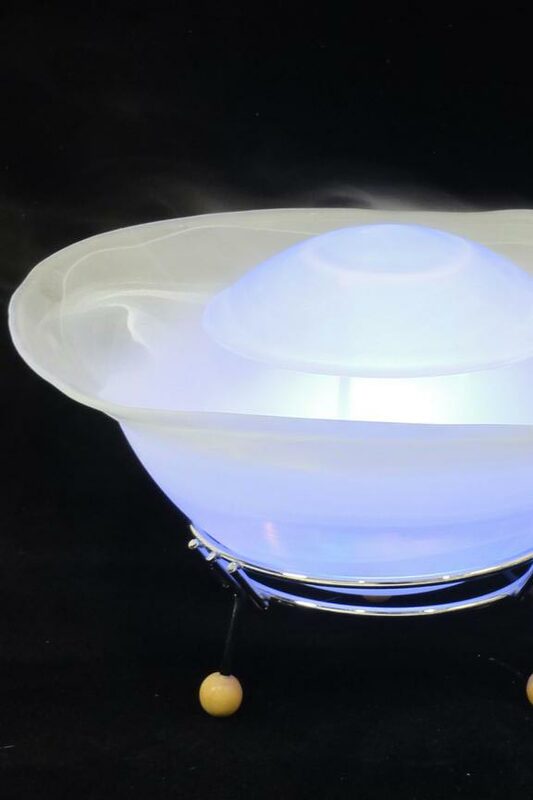 12 LED lights add to the visual effect as they change color and illuminate the glass bowl and the cloud of mist. Place it in any location to add a delightful focal point that everyone will enjoy. This table top misting fountain features a chrome plated, metal stand with wooden balls for feet. This simple but sturdy base holds up the glass bowl that is the main portion of the fountain. Choose from a blue or white bowl to fit your taste, or match existing decor. Inside of this glass bowl is where the misting device sits. It will remain submerged under water, and positioned flat against the bottom of the bowl. The mister included with model is a 16mm, auto-changing unit, and it features 12 LED lights around the top. There are three blue bulbs, three yellow bulbs, and three red ones. They will cycle and rotate to fade in and out of many color combinations as the mister runs. The cord for the mister will run out of the bottom of the unit, and plugs in to any standard outlet. It sounds pretty cool, and looks even better. 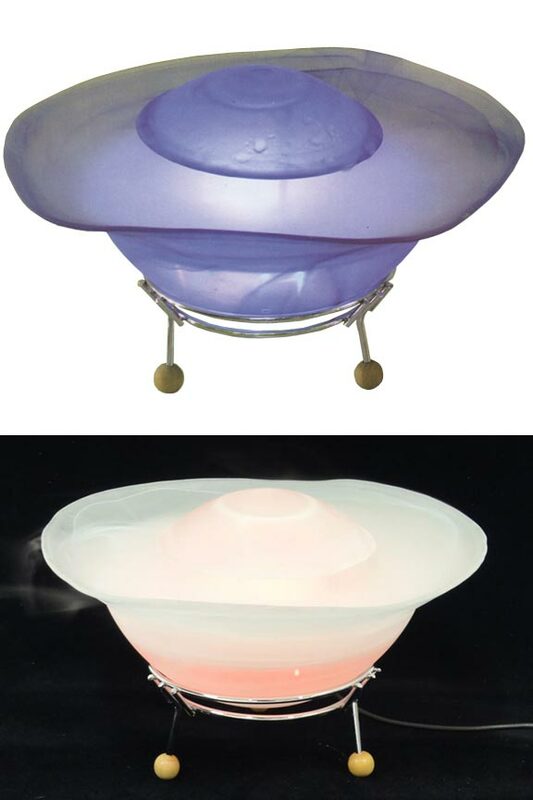 The technology behind this mist maker lamp is a method of evaporation brought about by a small disc vibrating at high speeds. The mister on this model features a 16mm, standard size disc which gives it ample surface area to produce thick clouds of natural mist. Looking at the top of the mister, the circular area in the center is where the disc is, and where the evaporation takes place. As the disc moves inside the cavity where it sits, it will begin to generate heat and friction instantly, and a natural fog will start to form on top of the water. The mist itself is quite cool, so the effect is very similar to that of more expensive and complicated cool mist humidifiers. The added benefit of this product is the look of course, but also the negative ion generation, and ability to diffuse fragrance. If you add just a few drops of oil into the bowl of water, the mister will scent the mist as it is produced. This can help to eliminate odors in the room as you improve air quality by increasing humidity. The ultrasonic vibration also produces negative ions as it makes mist. They mix with the air and neutralize dust and germs to clean and purify. Perfect for a child's room or anywhere else, this mister is a safe and natural way to add moisture to the air in your home. It can help to alleviate breathing problems, or help with other problems like dry skin, itchy eyes, and more. It is much nicer to look at than other cool mist humidifiers, and it serves the same function. Use it safely just about anywhere as a dynamic decoration, a colorful lamp, a unique water feature or just as a regular humidifier. When the air in your home gets dry, this decorative humidifier can solve the problem, and provide added benefits and enjoyment at the same time. Whether it is due to running your furnace in the winter, or turning on the central AC in the summer, common climate control techniques often lead to dry air. Get this fun looking product to make your home more livable without resorting to some ugly, or complicated machine to do the job. Order Yours Today! Uses Works as decoration, humidifier, fountain, lamp, fragrance diffuser and air purifier. Controllable Mister No - Auto rotates colored lights, and has no mist volume adjustment. Spa Mist - A unique decoration with added benefits. Add humidity to combat dry air, but also add ambiance thanks to the colorful lights and never ending cloud of mist. A table top water feature that would make a great addition to any hoime or office location. Order Yours Today! I am very happy with this product. Also, I was delighted with the short length of time from my order placement to its delivery. I am very happy with my mister...it is even prettier than the picture. It is worth the money and wait....it is the envy of my co-workers. Works wonderful and is a great addition to my office. I would recommend this site and product to all my friends. Can the color of the light be set and not constantly changing? This model comes with an auto-changing mister standard. The lights will automatically cycle. If you want to set it at a single color, you will need to upgrade to a controllable mister. this item comes is made with either a white glass or a blue...is the white available? do u have 2 in stock? Both colors are currently in stock. It may be the mister OR the AC adapter that is the problem. We sell replacements as sets for this reason. Please browse the replacement misters we have available, or give us a call for assistance. Can you turn off the lights and still have the mist?Or can you lower the lights and still have the misting? The included mister is NOT controllable at this time. You will have to replace it with a controllable unit to set it to run without any lights. I bouht this fountain but it is no lpnger working. What model misting device should I nuy? Sorry to hear this. Any or our replacement misters would be compatible with this model. Just choose the one that suits your needs. I have mist fountain. The bottom bowl holds the water. Do I put oils in the top bowl only and how high should the water be maintained? Can I leave the water in bowl when not in use? You add oil right to the water in the larger bowl. Start with one or two drops, then add more only if necessary. When using oil in the water, periodic cleaning will be necessary to remove residue build up over time, but leaving water in the bowl when not in use is totally fine. When you do clean the mister, make sure to use a damp cloth and no cleanser of any kind.